In Vitro preclinical toxicology studies. The use of tissue culture provides a valuable solution to address issues of clinical relevance, especially those related to screening, ADME (absorption, distribution, metabolism and excretion), studies of cellular toxicity mechanisms. 3D model in vitro tests for toxicity are beneficial for drug development because of reduced cost, ability to study of mechanism of action, and studies utilizing human cells. Presence of all cell types without any disturbance of natural milieu; Duration-dose dependent changes can be studied (ability to study changes for 14 days or more; not possible with cell lines); Ability to track the cellular changes in real time and derive a dose-response curve. Organ culture is a step closer to use of the actual living animal, as it consists of multicellular tissue supported by stromal elements. At present, we do offer organotypic slice cultures derived from rat pups (post-natal day 7-10) and also from young adult rats. The slices are viable for more than a month following a 7-14 day maturation period. End points to be studied will be custom designed depending on the client requirements. Drug screening is a long and costly process. It is big challenge in using animals as model to confirm with low productivity. It limits the discovery of new drugs. 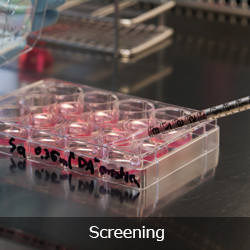 To reduce the number of animals in tests and to accelerate drug discovery process, recent efforts have been dedicated to developing cell-based high throughput screening. It helps to improve and fasten the drug screening process. It provides more relevant to in vivo biological information. The data obtained from tissue culture help pharma industry to determine potential efficacy and safety (e.g., predictive toxicity) of drug candidates. In vitro cell culture also provides information about morphology and cellular functions such as cell-cycle status, health and viability, and cell signaling pathways in drug discovery. 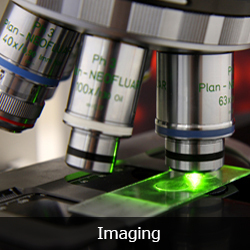 We provide these services as per the industry requirement. Stem cells are distinct self-replenishing cell population whose primary function is to generate progeny that develop into terminally differentiated cell types, such as a cardiomyocytes, neurons or receptors. This ability of cells known as “pluripotency” is a hallmark of embryonic stem cells (ESCs). Stem cells belong to one of two major categories according to their potency of differentiation: organ-specific stem cells and pluripotent stem cells. Organ-specific stem cells generally have limited potential for growth and differentiation. In contrast, pluripotent stem cells, such as ESCs and induced pluripotent stem cells (iPSCs) replicate in culture dishes and are theoretically capable of giving rise to any of the cell types found in the body. 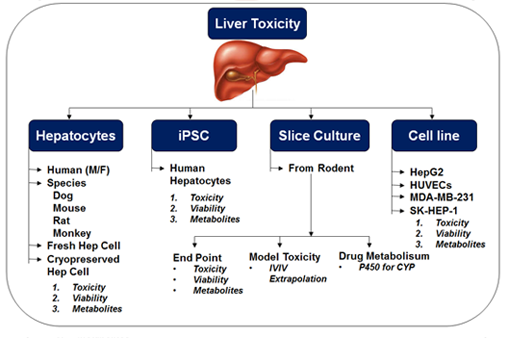 Most of the drug fails at preclinical stage because of liver toxicity and alterations of hepatic physiology. In addition, drug-induced liver injury is the most common reason for market withdrawal of approved drugs due to safety concerns. It is really difficult to predict liver toxicity because lack of biologically relevant and predictive model systems. Stem cells of hepatocytes will overcome these limitations and provide well-characterized, highly reproducible, and readily available human hepatocytes for preclinical drug development and safety testing. Drik provide services for human induced pluripotent stem cell-derived cardiomyocytes and hepatocytes. These human cardiac and hepatocytes cells are specifically designed to aid drug discovery and improve the predictability against structurally diverse drugs. They help researchers to better understand and optimize the predictive algorithm for applications in discovery toxicology, cardiac and liver safety screening. We obtained these iPSC from reliable source of well-characterized, highly reproducible, and readily available for preclinical drug development and safety testing.